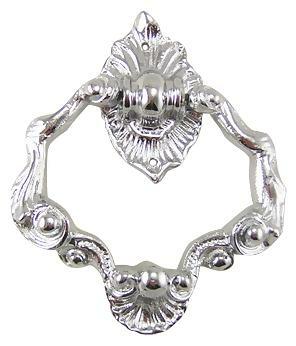 4 Inch Ornate Shell Pattern Ring Pull (Polished Chrome Finish) - measures 4 inches tall (overall) and 3 inches wide. Solid brass construction for decades of service - this piece is cast and finished by hand. Comes complete with the mounting hardware. Finishes available include Polished Brass, Antique Brass, Polished Chrome and Oil Rubbed Bronze.